Operatives of the EFCC are hunting for another former Group Managing Director of the NNPC in connection with the ongoing probe of ex-Petroleum Minister, Mrs. Diezani Alison-Madueke. The ex-GMD is yet to respond to EFCC’s letter of invitation sent through NNPC to him. The anti-graft agency may be forced to place the big man on watch-list and get him arrested. According to The Nation, Diezani is under investigation for N23.29bn bribery scam; controversial withdrawal of $153m from NNPC accounts; alleged $1.6billion money laundering and oil deals; posh $37.5m assets and plots of land on Banana Island and mansions in Nigeria and Dubai. 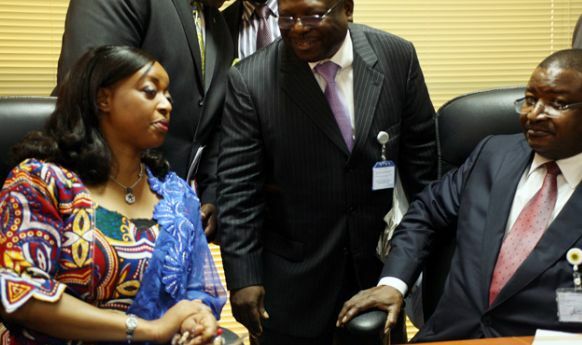 The ex-GMD is said to be vital to the ongoing probe of Alison-Madueke. A top source in EFCC said: “We are already looking for another ex-GMD of NNPC. We followed necessary protocol by inviting him through NNPC but he is yet to report for interrogation after many months of acknowledging our invitation. “We may be forced to watch-list the former GMD which can lead to his extradition from any part of the world. Responding to a question, the top source said: “We have been able to trace the country where the ex-GMD is at present. We only need to locate where exactly he is staying. The good thing is that we have a Mutual Legal Assistance Treaty with his host country which can hasten his arrest and repatriation. Already, EFCC has detained a former GMD of NNPC, Andrew Yakubu’s over alleged slush funds of $9,772,800 and £74,000. The huge cash was discovered in a fire-proof bunker last week.